It may be home to a famous movie star dolphin, but you won’t find much in the way of showmanship at Clearwater Marine Aquarium (CMA). Instead, there’s a focus on rescuing and rehabilitating marine animals. 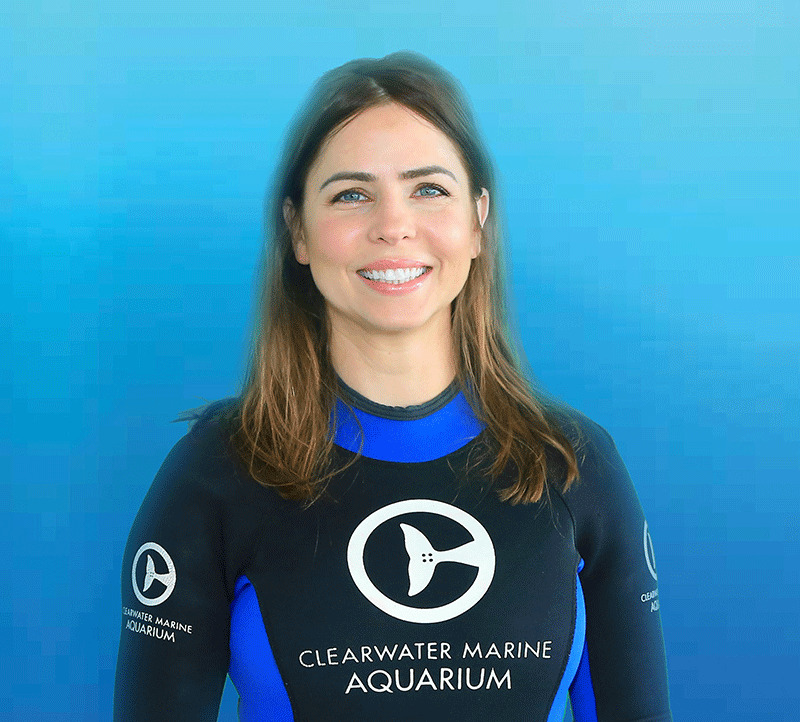 We asked Abby Stone, an Animal Care Specialist and Stranding Coordinator at CMA, for an in-depth look at the aquarium. 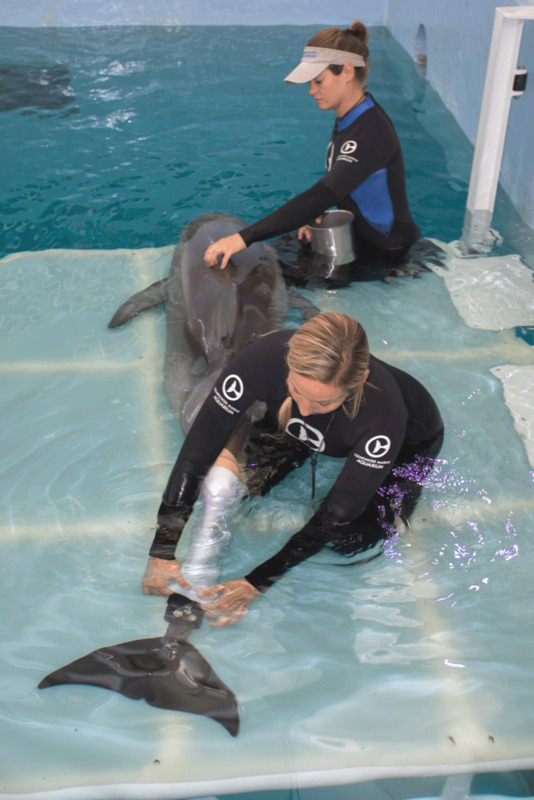 Guests of Clearwater Marine Aquarium will experience a working animal hospital. 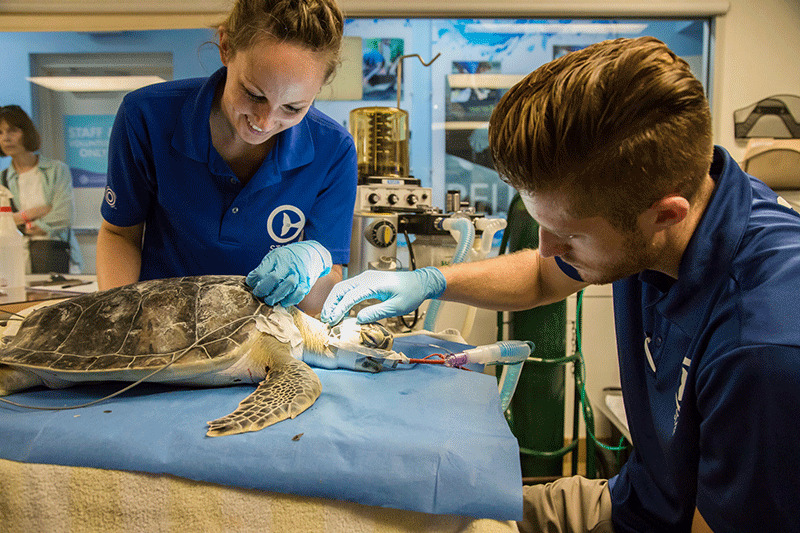 CMA provides specialized care to marine animals in need, helping to heal sick and injured marine life as well as to provide homes for those that require life-long care and attention. Animal care and feeding sessions take place in full view of CMA’s guests, providing many opportunities to observe and learn about rescue and rehab through public narrations. Each animal is special and guests will come to know their stories. Each patient provides new and valuable information that benefits other individuals and species that contributes to conservation in the wild. 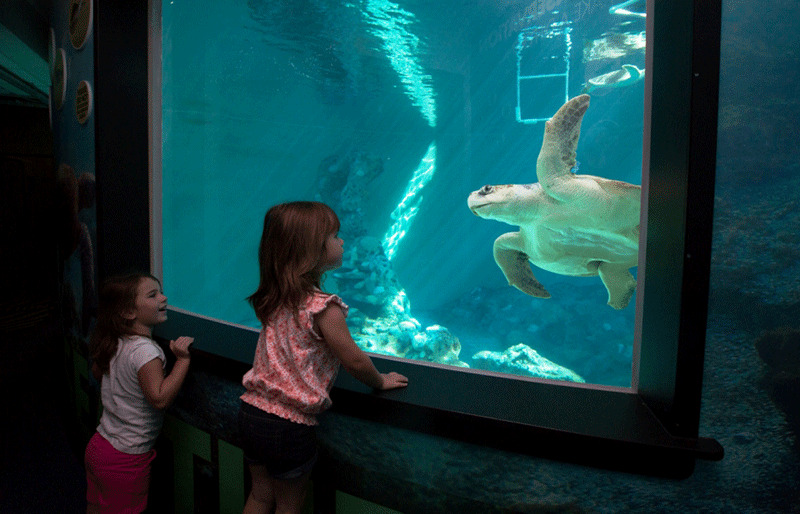 In addition to animals, guests can view CMA’s surgical center and staging areas for animal care and rehabilitation. Eco-tours, Behind-the-Scenes and animal encounter programs are available on a limited basis to provide guests with more in-depth experience of our marine animal hospital. Winter (whose story was portrayed in the 2011 movie Dolphin Tale) lost her tail when she was a calf entangled in the line of a crab trap and is now a global icon for environmental education. Her story has been broadcast worldwide and has literally reached millions of people. Winter puts a face to the severe issue of human negligence in our ocean environment. Through our daily public presentations, people are able to see the effects that one crab trap had on one dolphin calf. We challenge members of the public to think about how many other animals are impacted by human activity in the wild. We encourage them to be inspired by her story. A significant factor in Winter’s success is the relationship Winter and her care specialists have developed over the years. Animal care specialists are an integral part of her life and they facilitate her medical care and attention given to her cognitive and physical needs. Each relationship is uniquely reinforcing to Winter. Each care specialist provides spontaneity, creativity, and their own unique way of interacting. While each day is different, these special interactions can be observed every day throughout the day. Winter can be described as “talkative.” She often vocalizes in her sessions and during playtime with her companion, Hope. As part of CMA mission, we believe in inspiring the human spirit. The work we do with animals has a positive impact on the environment and people. Rescue, rehab, and release is integral to our mission. Each animal in our care provides a unique opportunity to benefit other individuals and species and contributes to conservation in the wild. CMA shares stories of the animals that have been saved to inspire and help people. That inspiration comes from learning about a special animal and then having the opportunity to see them at CMA. Some of our guests struggle with prolonged medical treatments, grieving, life challenges and difficult circumstances. Being face-to-face with an amazing animal with whom they can relate is a powerful experience. In some cases, CMA’s care specialists help to facilitate special encounters. This is where an individual has an opportunity to get close to one of our special animals. This is usually arranged in advance through CMA’s Guest Services Department. Encounters are good enrichment opportunities for the animals. Encounters also provide people with an opportunity to be totally immersed in an amazing experience that brings hope and joy, which creates lasting memories. Some of our guests struggle with prolonged medical treatments, grieving, life challenges and difficult circumstances. Being face-to-face with an amazing animal with whom they can relate is a powerful experience. It seems to provide relief and an opportunity to just be in the moment. It’s a powerful motivator for children and adults. People adopt the belief that if Winter can do it, they can too. This is true for many of the animals. The reaction of guests to the animals has been a lot of smiles, laughter, and good tears. 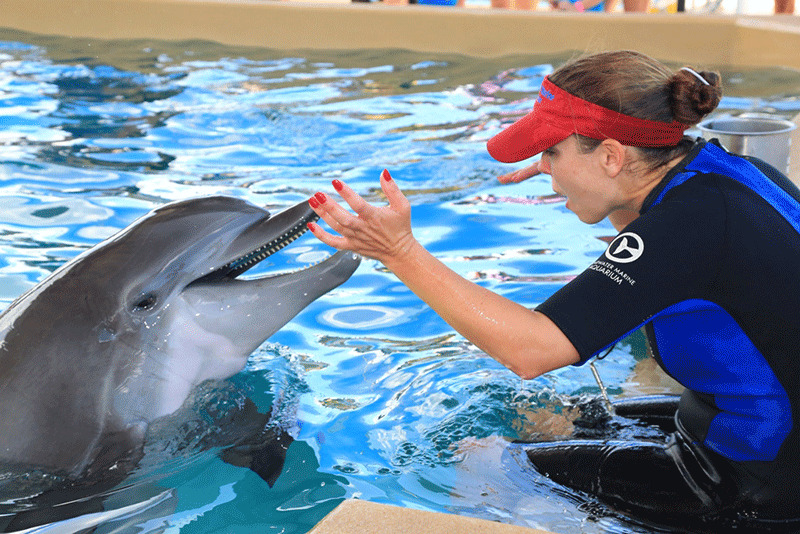 Many of the animals are inquisitive by nature and each animal responds positively to guests that offer their favorite things like fish, toys, and playtime. The most notable reactions from an animal toward a guest would be when Winter investigates a person’s prosthesis, she shows a lot of interest. As a Rescue Team staff member, there’s a lot of variability one day to the next and everything revolves around the primary focus of the team, which is rescue and rehab. Since stranding events are unpredictable, the team works hard to be prepared at all times. This keeps everyone on their toes. My job responsibilities range from animal rescue to answering interview questions. As for my favorite animal, I appreciate all of the animals at CMA though I am partial toward the dolphins. I was one of the original animal care specialists on staff when Winter arrived at CMA in December 2005, and was an integral part of her care giving. I became involved in CMA as an intern in high school because of my interest in marine mammals at a young age. The best part of my job is the fulfillment I receive helping the animals. CMA specializes in the rescue and rehab of marine mammals, sea turtles and wildlife, including North American river otters. The Rescue Team maintains a 24/7 animal emergency hotline (727-441-1790 x1) and we rely on the public to report sick and injured animals. CMA’s team of veterinarians review each animal case. If determined that an animal will benefit from rehabilitation, then it will receive the appropriate care. CMA is permitted by and works closely with federal (NOAA) and state (FWC) agencies to determine the best course of action for marine mammals and sea turtles. Healthy animals that have a reasonable chance of survival in the wild will be released after successful rehabilitation.